Crimson Spot Rockrose is an open branching shrub with deep green waxy, wavy leaves. Covered in this white crepe paper blooms in early spring, Crimson Spot makes quite a show. 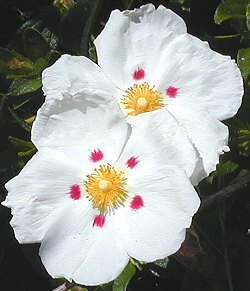 Rockroses need good drainage and at least five or six hours of sun each day. They can be pruned after bloom or left to clean themselves up. We like them in a naturalized setting where no maintenance is required.